Now with discussion questions and assessment tools to help you determine your unique ministry fit.By the coauthor of the Network course materials developed at Willow Creek Community Church Have you found fulfillment in life? Can you say your ministry is fruitful? God has created you to be both fulfilled and fruitful in a meaningful place of service. 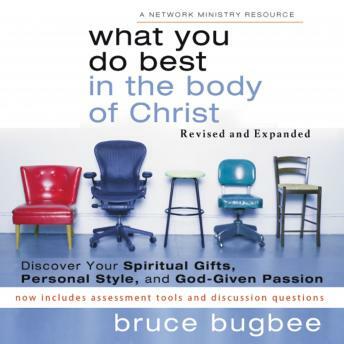 You can discover your God-given design and the role he created for you in and through the local church.In What You Do Best in the Body of Christ, Bruce Bugbee helps you identify your God-given spiritual gifts, personal style, and ministry passion. And he shows how they point to your unique role and purpose in the body of Christ when they are expressed together. Drawing from biblical principles, this book provides proven tools and a conversational approach that will help you fulfill God's will for your life. You'll discover:Your God-given Spiritual Gifts indicate what you're equipped to do competently Your God-given Personal Style indicates how you can serve with energy and authenticity Your God-given Ministry Passion indicates where you're motivated to serve Together, they indicate what you do best in the body of Christ!You will also better understand God's design for the church and your role within it.You'll find plenty of helpful charts and self-assessments-plus insights into the fallacies and pitfalls that can hinder your effectiveness. Start learning today what God wants you to do, and experience more enthusiasm, greater joy, and real significance in your life and ministry.